KIEV, Ukraine -- Over the weekend, the President and the Prime Minister of Ukraine met with the representatives of the businessmen protesting against the new Tax Code, adopted by the Ukrainian Parliament on 18 November, 2010. 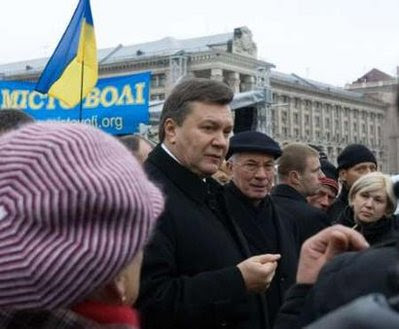 Ukraine's President Viktor Yanukovich (2nd L) talks to demonstrators holding a rally to protest against a proposed new tax code, while Prime Minister Mykola Azarov (3d L) stands nearby. Since then, the representatives of Ukrainian SMEs have been protesting on the country's main Independence Square in Kyiv, demanding the President's veto of the Code. In response to the protests, the President Yanukovych and the Prime Minister Azarov decided to personally talk to the entrepreneurs. The country's two main officials spent more than an hour over tea with the SMEs representatives in one of the tents put up on Kyiv's central square. As a result, Yanukovych stated that the possibility of vetoing the document is very high. "We share the same goal: to bring the economy out of shade and stimulate the development of the country and business through tax policy," he said. "I object this Code's strengthening of the administrative pressure of the Tax Administration on business". Viktor Yanukovych suggested the protesters and the Ukrainian government create a special joint working group. Aimed at simplifying the Ukrainian tax system, the Code, however, gave rise to much controversy among businesses. Many SME owners throughout the country claim they would significantly suffer from the new tax system which the Code is designed to introduce. The key point of controversy in the new Tax Code is the so-called simplified taxation system, introduced in 1999. According to the system, individual entrepreneurs with annual revenues not exceeding 300.000 UAH (37500 USD) are allowed to pay the unified monthly tax of 200 UAH (25 USD) with an exemption from all other taxes. Thus, many small businesses were relieved from a heavy tax burden. However, as reported by many analysts, the simplified tax system was largely used by the Ukrainian companies to evade or minimize their tax liabilities. The new Code introduces numerous restrictions on the simplified tax system as to minimize the possible tax evasions. As the protesters claim, together with the tax evasion schemes, those restrictions will destroy many diligent small businesses. Yanukovych offered to check "every syllable" in the draft before 2 December, when he will return from an OSCE summit in Astana.